It allows you to migrate your short urls to other service in future if you choose to do so. From the top navigation, click on Custom Domains in the dropdown. Specify the Default URL where a visitor will be redirected if a valid short url is not found or if the your custom domain is visited directly. Based on your DNS provider, it might take up to an hour for the changes to propagate. 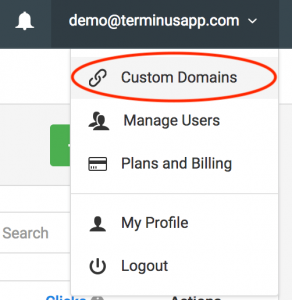 You can verify it by looking for a checkmark next to your custom domain in Terminus. If your plan supports it, you can optionally request to have SSL/HTTPS enabled for your custom domain. This will allow you to share HTTPS version of your short urls, e.g. https://ex.mp/promotion. This provides additional privacy and security to your website visitors. Once you request it, we’ll provision SSL certificates for your custom domain (provided your DNS settings are verified) and enable HTTPS for this domain. This process can take 2-3 business days. After the initial setup, all the certificate renewals are handled for you provided the custom domain is still pointing to Terminus servers. While in your project, navigate to Settings > Shorteners. 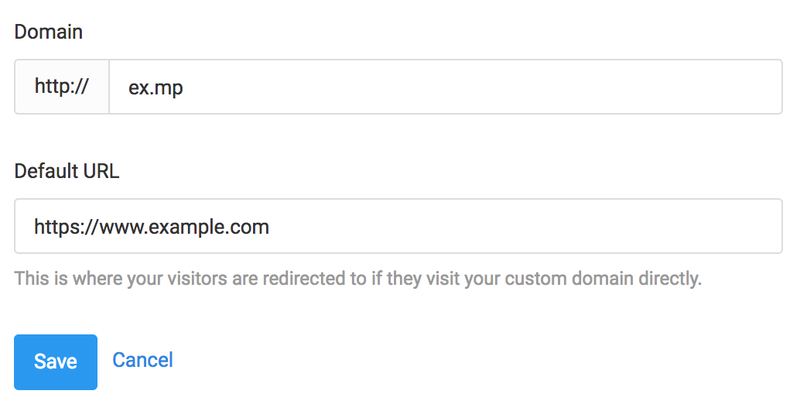 Select your recently added custom domain in the dropdown. Any new URLs you create in your project will now use your own custom domain for shortening.